December 8, 2006. For those people able to receive their TV broadcasts from SKY in Europe, there will be a very interesting documentary on Lockerbie on the Al-Jazeera English channel. This documentary should be aired on the 18th anniversary of the crash of Pan Am 103 which took place on December 21st, 1988. August 1, 2006. I have received the following two emails from Dr. Jim Swire which I think you will find interesting to read. Please double click the following hyperlinks. June 12, 2006. According to my best information, the Scottish Criminal Cases Review Commission will issue its findings by end July, 2006. The Megrahi sentencing hearing has now been delayed until October, 2006. There are some considerable legal and political negotiations going on between the Pan Am 103 victims' families and certain interested parties who are seeking the truth about what happened to Pan Am 103. Please double click the following images to read an email I have just received. I believe you will find its contents very interesting. You can read the interview between Hans Koechler and Al Jazeera by double clicking these two images. May 22, 2006. There have been some very interesting developments in the Lockerbie case - some of which are very disturbing. The U.S. government has suddenly removed Libya from the list of "countries supporting terrorism". On July 11, 2006 Megrahi will appear in court where his prison sentence will be reviewed. Why are these events are taking place prior to the review by the Scottish Criminal Cases Review Commission which is expected some time in July? 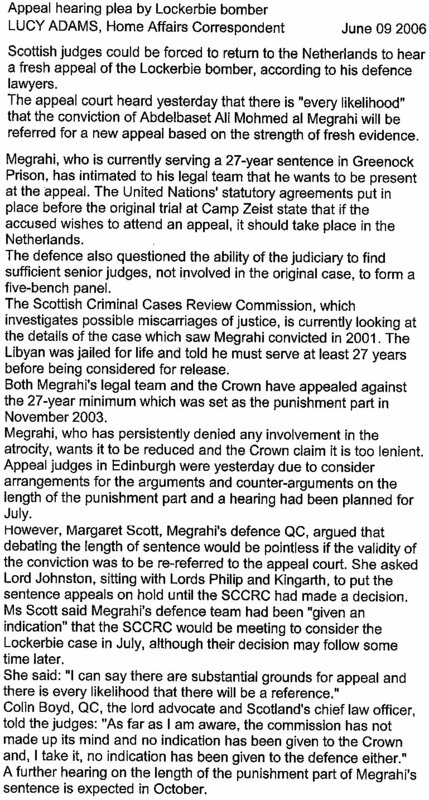 Could it be that the SCCRC is having great difficulty supporting the verdict against Megrahi? May 6, 2006. Abdelbaset al Megrahi. It has recently been announced that Megrahi will be appearing in the Scottish court on July 11 - 12, 2006 for a hearing related to the length of his prison term. Some will argue that the term should be longer and others that it should be shorter. I will keep you posted. The Megrahi legal team and others are forging ahead with evidence which will ultimately show that Megrahi and, indeed, Libya were not involved in the crash of Pan Am 103. April 9, 2006. The British newspaper, "The Sunday Express", published an article entitled "The Lockerbie 'cover-up'". You can read this article by double clicking the following thumbnails. The person removed from the crash site was a Lebanese man called Jaffa. This is a very interesting part of the Lockerbie case, details of which are fully explained in my book. March 25, 2006. John Armand aired his Lockerbie documentary on "MSNBC Investigates" at 11 p.m. EST on March 25, 2006. Unfortunately, this documentary should be classified "a story about Lockerbie" and not "an investigation". 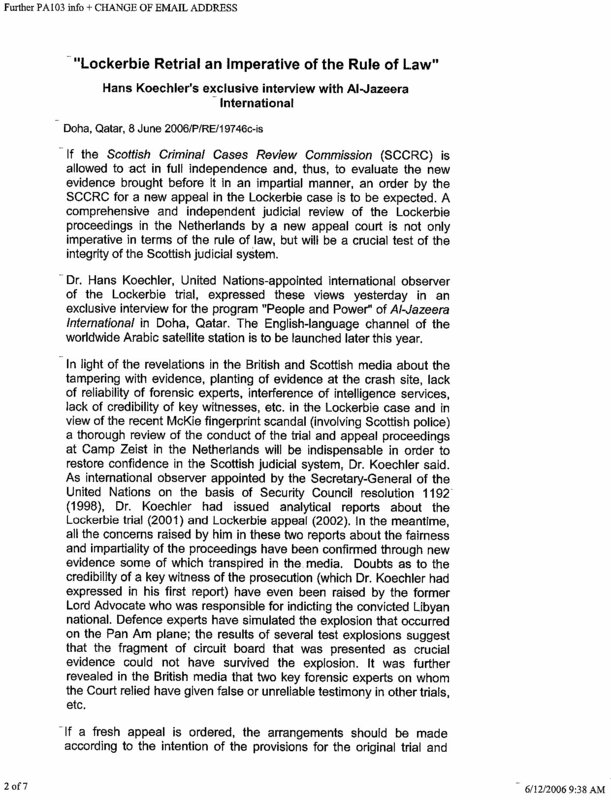 This documentary could have been written five years ago and gave absolutely no indication that the case against Libya is being seriously questioned, as you can read on this web page. 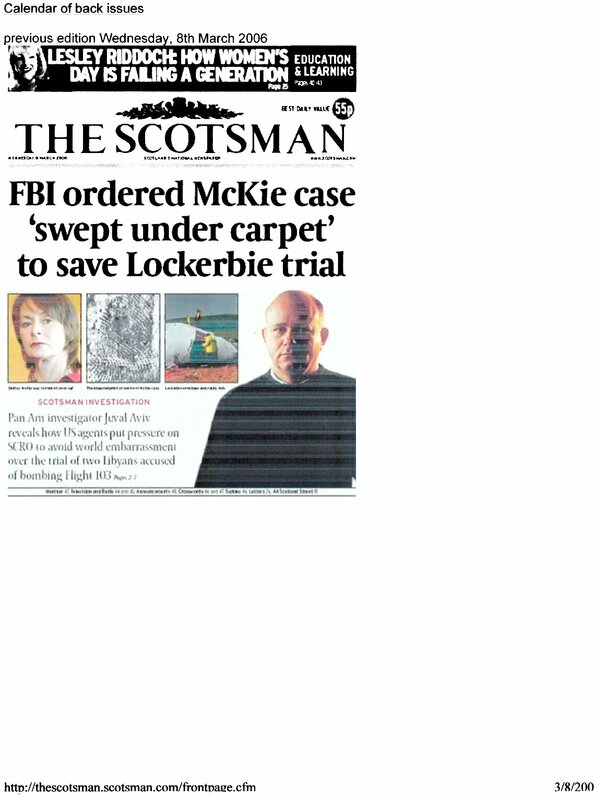 In the next two months there will be two Lockerbie documentaries shown on TV. 1. In the U.S., NBC "Dateline" will be airing a documentary on March 26, prepared by John Armand. 2. In the U.K., a documentary is being prepared for airing on "Panorama" in May or June, 2006. I have just learnt that the Scottish Criminal Cases Review Commission will be issuing its findings sometime in May, 2006. March 8, 2006. There have been some important developments in the Lockerbie case, some of which you will find very disturbing. Dr. Jim Swire has received information that suggested that armaments may have been illegally placed on Pan Am 103. If these weapons had exploded, they could have contributed to the complete destruction of the aircraft. On February 3, 2006, Dr. Swire wrote the following letter to the Lord Advocate in Edinburgh, Colin Boyd, requesting an investigation into this report. (This letter is now in the public domain.) Double click the following hyperlink to read Dr. Swire's letter. I have located a videoclip from a TV documentary with Dan Rather on the History Channel. This concerns Flight TWA 840 - a Boeing 747 - from Tel Aviv to Greece, Athens, on April 2, 1986, which experienced an explosion on board caused by an IED as the plane approached Athens. A hole was blown in the side of this Boeing 747 but it landed at Athens and was later repaired and put back into service. I have to question why Pan Am 103 disintegrated in mid-air, when the plane should have been able to withstand the explosive forces of a small IED in a suitcase, in the cargo hold. Could there have been an additional explosion, as detailed in the letter above to the Lord Advocate, or did the plane suffer catastrophic disintergration in Section 41, caused by metal fatigue. By double clicking the following hyperlink, you can review the TWA 840 incident as it was reported on the History Channel. 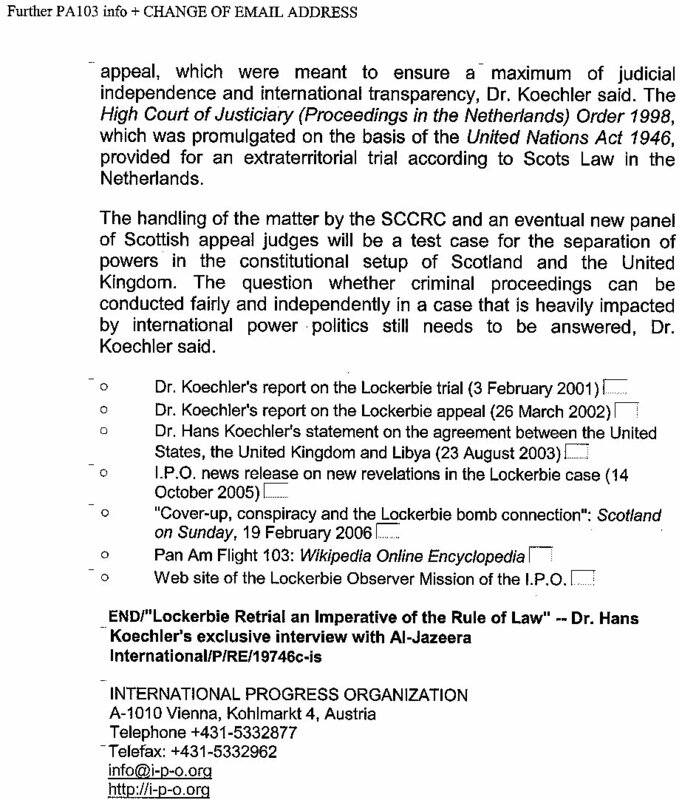 Most of the work that is being conducted on the Lockerbie case is being conducted by the Scottish court in Edinburgh. However, there is an equally important lawsuit being undertaken in Washington, D.C. Lester B. Coleman became involved with the Lockerbie case shortly after the plane crashed over the town of Lockerbie. He wrote a book called "The Trail of the Octopus" which was banned in both the U.S. and the U.K. If this story had taken placed in Romania during the reign of Nicholae Ceausescus, it would simply be another horrific story about a ruthless dictator. However, the Lockerbie and the involvement of Lester B. Coleman took place in the United States. "I strongly urge you read the attachment, complaint that has been in litigation in the federal district court, wash dc since 09/04. Repeated efforts by the US govt to dismiss it have been over ruled by US District Judge, Emmett Sulivan. It exposes who was really the root cause of the bombing of pan am 103 and why the US govt was so hell bent to hide it." Double click the following hyperlinks to review the Lester B. Coleman court papers. 1. Before the end of April there should be an announcement from the Scottish Criminal Cases Review Commission which will have decided whether or not Mr. Megrahi will stay in jail, be released, or be entitled to a new trial. 2. My publisher, Algora Publishing of New York, has just informed me that there will be a new book on Lockerbie, written by an "official investigator" in the case. It will be fascinating to read this book as, hopefully, it will provide us with some additional insight into the case. 3. A new TV documentary is being prepared for initial distribution in the U.K. and later in the U.S. Please come back often. I will keep this webpage up to date. December 21, 2005. Seventeen years ago someone placed an IED on Pan Am 103 and caused it to crash over Lockerbie, Scotland. I have been working on this investigation for 10 years and I hope that in 2006 we can finally determine who was responsible for this disaster. I have decided to start this new webpage as I believe there will be important developments during 2006. We have located a Toshiba radio cassette, RT-SF 16, for which we are missing the operator's manual. We are also seeking three models of the Toshiba radio cassette, RT-453. IS THE TRUTH ABOUT LOCKERBIE FORTHCOMING? Read the following article wherein a police officer has signed a statement to the fact that the Toshiba radio fragment was planted! The following article was emailed to me from a reliable source. The validity of this very important article is now being questioned. The author is a well-respected journalist, but at this point in time we are unable to verify the sources of his information. I am being very careful not to post any conspiracy articles or anything else that is not properly documented and corroborated. However, it is an interesting article and it may have been disseminated for the purposes of discrediting Megrahi's legal defense team. I will keep you posted. Flight 103 in December 1988.
ing 27 years for mass murder. ing been planted at the scene of the crash. made by a former CIA agent. of the murders of 270 people. which can order fresh appeals. and the East German Stasi. out on the conduct of that appeal. jail for what they have done. they knew it was the PFLP-GC. expected to have to act it out. tured case, mistakes were made.